He then goes on to list the budget deficit by year and points out the fact deficits have been at record highs since 2009 when Obama took office. Look at the big jump in the deficit after Obama took office. According to Hinderaker, that jump is due to Obama’s big spending increases. But CBO estimates of the 2009 deficit published two weeks before Obama took office were $1,186,000,000,000. 84% of the 2009 deficit was already baked in the cake before Obama took office. Blaming him for that is, at best, deceptive. What Hinderaker also fails to mention is these deficits have mostly been caused by a large drop in tax revenues due to the recession and an increase in Social Security and unemployment benefits – not Obama. 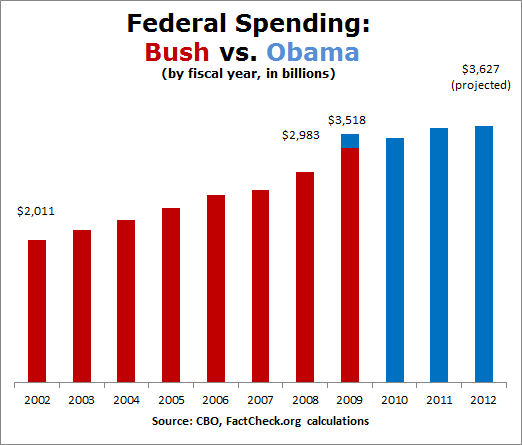 For anyone interested in a detailed breakdown of Obama’s actual spending record, FactCheck.org has a very good analysis. They estimate Obama has increased spending at an analyzed rate of 3.1% during his first three years – less than half the rate of the previous administration. « The National Debt, Who’s To Blame?